The origins of autonomous vehicles research goes back to 1977, when the Tsukuba Mechanical Engineering Lab in Japan constructed the world’s first intelligent vehicle, which tracked white street markers, achieving speeds of up to 30 km/h. Between 1987-1995 the European Commission funded the EUREKA Prometheus Project, a research and development program dedicated to developing driverless cars. In 1994, at the final presentation of the EUREKA project in Paris, the VaMP and its twin VITA-2 robot cars, developed by a team of engineers from the University of the German Federal Armed Forces in Munich in collaboration with Mercedes-Benz, drove more than 1000 km in heavy traffic on a three-lane highway at speeds reaching 130 km/h. These vehicles used dynamic vision to detect moving obstacles and were able to automatically avoid and pass other cars on the road. The re-engineered semi-autonomous Mercedes cars were able to control the steering wheel, throttle and brakes through a computerized command system, which relied on real-time evaluation of image sequences, requiring some human intervention. One year later, a Mercedes-Benz model constructed by the same team, drove from Munich to Copenhagen and back, exceeding speed of 177 km/h, and completing the journey with 95% autonomous driving. 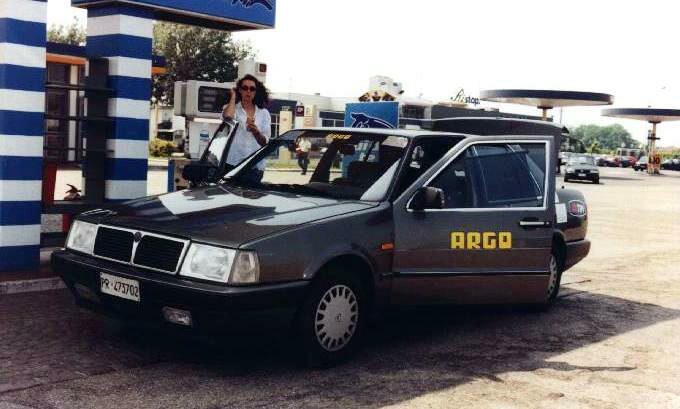 Between 1996-2001, the Italian ARGO project featured cars that were able to follow regular painted white lane marks in an unmodified highway – the altered Lancia Thema, which achieved an average speed of 90 km/h at 94% automation, was equipped with only two black-and-white video cameras and used stereoscopic vision algorithms to follow its path. The impressive abilities shown in the field of vehicular robotics have sparked worldwide interest and research in this area – including the DARPA-funded “DEMO” projects. These programs focused on the development of vehicles able to navigate through difficult off-road environments, and provided the initial knowledge and experience in the field of automotive robotics. 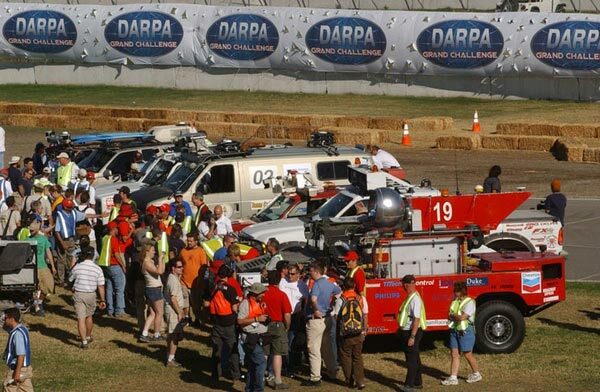 The DARPA Grand Challenge features autonomous ground vehicles maneuvering in a mock city or outdoors environment, executing simulated military supply missions while merging into moving traffic, navigating traffic circles, negotiating busy intersections, and avoiding obstacles. Before the applicants can qualify to participate in the main event, they must pass a year-long selection process, which consists of a number of steps. First, the teams submit technical papers and demonstration videos, followed by site visits from DARPA technical experts, who evaluate each vehicle by testing its ability to navigate a narrow 200-meter course that contains turns and randomly placed obstacles. Next, the selected teams participate in the National Qualification Event – a series of tests, in which the designed cars navigate a rugged course, simulating the conditions found on the final challenge route. Teams from the U.S. as and other countries are eligible to apply, and in past years, the participants formed a diverse group from both academia and the robotics, automotive, and defense industries. The goal of the contestants is to design a vehicle, which will be able to complete the selected course at a minimum elapsed time under the specified time limit. The exact route to be taken is announced only few weeks before the main event, where all teams compete on the same course, and vehicles are started off at equal time differences to prevent collisions and ensure that robots do not interrupt their competitors. During the race, robotic cars are followed by manned vehicles, which can disable the car from a distance (automatically disqualifying it), in case it gets permanently stuck on the way or poses a safety threat. More than 100 teams registered for the first event, which was held in 2004 in the Mojave Desert in the US. 15 teams were selected to participate in the final race, after they successfully passed a series of mandatory qualification tests and demonstrations. During the preliminary test, in which the vehicles faced a 1.6 km obstacle course, only 3 teams successfully drove through the path. Despite that, DARPA decided to allow all teams, selected for the preliminary race, to participate in the main event. At the final challenge, none of the robots succeeded in completing the 240 km path, due to various failures along the way. The vehicles brushed walls, went through fences and even flipped over when trying to make 90-degree turns. The robotic car with the best result in the 2004 competition was designed by the “Red Team” from Carnegie Mellon University in Pittsburgh – however after completing just 12 km of the track, the robot went off course on switchbacks in a mountainous section of the road, got caught on a berm and the rubber on its front wheels caught fire. It was recognized that the most critical problem for many of the participant’s designs was the inability to handle two different tasks simultaneously, such as avoiding an obstacle while continuing to follow the GPS road-points. 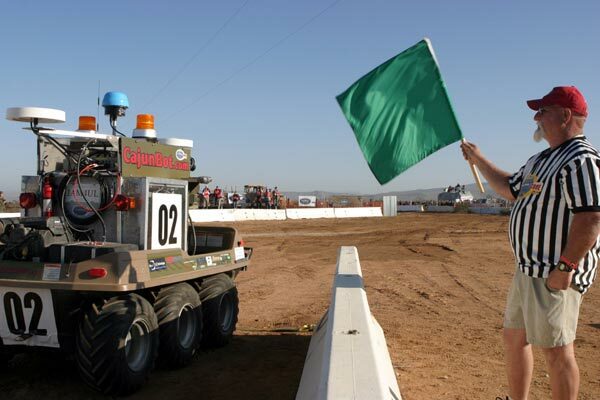 When the race ended and no winner could be announced, Dr. Anthony Tether, Director of DARPA, said that although none of the teams was awarded the cash prize, the first challenge provided major insights into autonomous ground vehicle technology. The somewhat discouraging results of the first race did not affect the 196 teams from 36 states and four foreign countries, who applied for the second competition, held in 2005. The first winner of the Grand Challenge was “Stanley” – a robotic Volkswagen designed by a team from Stanford University. Their vehicle succeeded in completing the entire 212 km course in six hours, 53 minutes and 58 seconds, with the average speed of approximately 30 km/h. Out of all 23 finalists, four other vehicles reached the finish line in the Mojave Desert, but only the Stanford team was awarded the $2 million prize. Compared to the 2004 Grand Challenge, the 2005 competition was considered to be an enormous success – only one entry failed to pass the distance completed by the best-performing vehicle in 2004. The race, which began in early morning, was paused overnight with only one car remaining on the route. In order to design an autonomous vehicle, one needs to make sure it’ll incorporate all the senses, brains, and control abilities of the human driver, in order to maintain safety conditions on the road. This is achieved by applying various tools to the robotic car’s mechanism, such as advanced sensors, computation, actuation and navigation systems. Several automotive companies use recent advances in the field of neuroscience to develop vehicles that can be “taught” through adaptive learning environments. This innovative “Artificial Intelligence” approach aims to enable a human to “teach” the vehicle how to steer over weeks of training in an off-road environment. Experts envision this process accomplished through further advancement of “machine-learning” algorithms, a popular field of study in contemporary computer science. The technologies seen at the DARPA Grand Challenge events over the years represented the most recent, state of the art advancements in mechanical engineering, particularly in the field of robotics. Improvements in the applied technologies were easily seen through the last two competitions, where the participating vehicles showed dramatic increase in both the distance passed, and the ability to detect and avoid various road obstacles. This year, a team from the Massachusetts Institute of Technology (MIT) will participate in the NQL challenge in November for the first time, hoping to overshadow the other contestants with their design. Their self-piloted “Robocar” is equipped with multiple laser range-scanners, high rate video cameras and automotive radar units. At any given moment, the car constructs a “local map”, built in real-time as the road progresses. The map is based on information from the devices installed in the Land Rover LR3 with 40 central processing units performing data analysis. These provide the car with the necessary information about the immediate borders of the road and other nearby objects, like lane markings, stop signs and other crucial signals for the virtual driver. Another participant in this year’s NQL competition comes from the Freie University in Berlin, Germany. Two-time world champions and five times European champions in robotic soccer, the Freie group is participating in the DARPA challenge for the first time. Their vehicle, named “Spirit of Berlin”, is a result of collaboration between the German scientists, including experts from the Fraunhofer Society, and researchers from Rice University in Houston, Texas, as well as the Universidad de Monterrey in Mexico. The scientists say they achieved a stable and reliable robotic platform, thanks to technology used in cars intended for use by the handicapped. “It is a mature segment of the car industry offering vehicles which can drive for thousands of miles without hardware errors.” – they said. The team purchased a Dodge Grand Caravan, and modified it for drive-by-wire technology – a tool that replaces the traditional mechanical and hydraulic control systems with electronic control systems using electromechanical actuators and human-machine interfaces such as pedal and steering feel emulators. The researchers explained that the purchased car, which previously belonged to a handicapped person, could drive using a linear lever for brake and gas, which was able to control all intermediate steps between full braking and full acceleration, and a small wheel for steering the front wheels. The rest of the car’s components could be controlled through a small contact sensitive panel. With additional electronics installed, the vehicle was modified so that it could be controlled using a computer connected A/D converters. The drive-by-wire actuators are operated by an embedded computer with three interface channels: an analog input connection for steering, accelerating and braking; a serial input connector, which accepts commands for changing gears, controlling the car’s lights and other secondary functions; and finally, a CAN-bus interface, which is used to retrieve real-time information about the car’s speed, current position of the steering wheel and other data. The team members said that one of the major challenges in the design of their automotive vehicle was providing the necessary energy for the computers and sensors – in order to have enough power, the scientists installed a new alternator, which converts mechanical energy to alternating current electrical energy, and mounted a new power distribution cables into the car, in addition to two extra batteries. 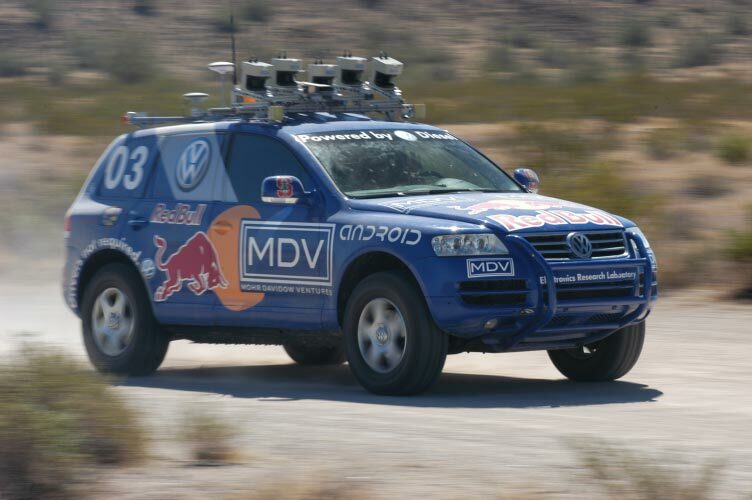 As many of other participating teams’ vehicles, the “Spirit of Berlin” uses a large set of sensor systems. 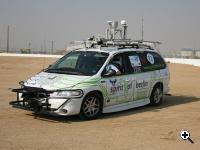 The car is equipped with an accurate GPS navigation system, powerful short and long range laser scanners – both flat and 3D, radars, cameras installed on top of the car, and advanced customized computer vision systems. For this year’s Urban Challenge, DARPA has selected 20 teams to participate in the main race – these are the top teams chosen from a total of 36 participants at the National Qualification Event (NQE), which was held between 26th – 31st of October 2007. “The depth and quality of this year’s field of competitors is a testimony to how far the technology has advanced since the first Grand Challenge in 2004” – said Dr. Tether. DARPA announced that both the Urban Challenge NQE and final event will take place at the urban military training facility located on the former George Air Force Base in Victorville, California. DARPA officials said they chose this location because it best simulates the type of terrain American forces operate in when deployed overseas. 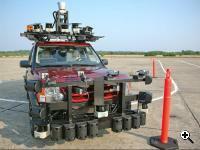 This year, DARPA added a new criterion, on which the vehicles’ performance will be measured. As oppose to previous competitions, where the sole goal was to reach the finish line in a minimal amount of time, this year’s participants were tested on road-ethics as well. The vehicles are expected to drive according to the exact traffic rules, obeyed in the State of California – over a hundred people will be positioned on the course path, in order to gather data on the behavior of the cars, and it is possible that even though the vehicles will pass the finish line within the specified time limit, none will be declared as the winner of the challenge, in case they fail the “driving test”. For each traffic fault committed during the course, time penalties were added to the vehicle’s elapsed time. Other major factors, which were taken into account, were the achieved speed and safety – vehicles mustn’t damage their surroundings in any way. The road followed looked a lot like a suburban neighborhood, complete with houses, traffic circles, street signs, trees and sidewalks, in addition to sandy, desert-like parts. DARPA set the time limit for this year’s challenge to six hours for the 96 km course, meaning the vehicles will have to achieve an average speed of at least 16 km/h, in order to comply with the requirements. 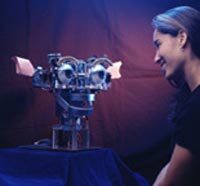 After DARPA’s first challenge, many were skeptical as to whether the pursuit towards automotive vehicles will get humanity anywhere near the ultimate goal – the development of robots that will be able to carry out long-range military missions, without endangering civilian and soldier lives. Safe supply and evacuation missions are among many future tasks scientists assign to their future creations, and after the 2005 Grand Challenge, even the most skeptical of critics said it was proved that automotive vehicles have a solid potential to become exactly “what we want”. Since the start of the program, research and development of automotive vehicles accelerated and when five unmanned vehicles successfully completed a 212 km course in 2005, it a clear sign of the tremendous technological breakthrough achieved so far. Following the 2005 race, DARPA director Tony Tether said “These vehicles haven’t just achieved world records, they’ve made history”. Tether compared the success of the event to the Wright Brothers’ first flight in 1903 saying that it was proved “it can be done”. As the technological pieces are beginning to fall into place, experts say that it will probably take two or three decades before autonomous vehicles will be introduced to the consumer market. The industry is facing many challenges – engineers say better sensors and more powerful processors are required, and so, the development of driverless cars is proceeding step by step: in recent years, much attention has been brought to cars that park themselves, and these are already offered for sale. Sensors that can detect objects in close surroundings of the vehicle, and “lane-control” systems, which alert the driver in case he attempts to execute a dangerous pass to an adjacent lane, are already in production. The technology that is mostly used in the development of automotive vehicles today is the “drive-by-wire” system. The idea is to replace the physical control systems, such as the steering wheel and brakes by a single control panel – for example, the driver would be able to control the steering wheel by a joystick-like device, and control the brakes through the panel, which will transfer the driver’s commands to the engine, by sending an electrical current. Controlling the vehicle will depend on the driver’s commands, received and interpreted by various sensors and processors, passing on the orders to the engine. In fully-automotive vehicles, the car makes the decisions on behalf of the driver, relying on data coming from the GPS navigation system, cameras, radars and other sensors embedded in the car. While it may take several decades before we’ll be able to purchase autonomous vehicles, partially-autonomous machines are already in use by the military, and defense firms are fast progressing in the development of robotic systems, specifically for military use. The U.S. Army is using “Stryker”, an armoured personnel carrier (APC) used in Iraq,, as a surrogate for testing automotive technologies. 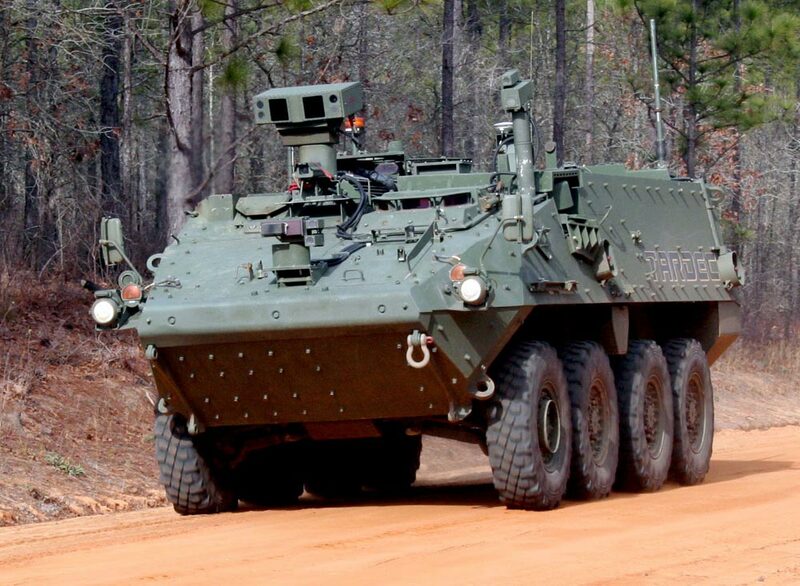 The eight-wheel combat vehicle, equipped with scanners, lasers and cameras, is able to process data gathered by these sensors regarding its immediate environment and make instant decisions about future actions based on this information. The vehicle, which was already used as an armored troop carrier and can navigate through difficult terrains in deserts and forests, is not fully autonomous and a driver is required to partially operate it. There are several autonomous ground military vehicles, currently in use by the U.S. Army – the SWORD robots are already patrolling battlefields in Iraq, carrying out mostly surveillance and bomb disposal missions. The recently developed MAARS robots are considerably more mobile and lethal – equipped with a GPS navigation system and a powerful M240B Medium Machine Gun, these can be instructed in real-time to fire at previously defined zones. The military aims to develop these vehicles up to a point where they could be safely used to search for road-bombs, survey battlegrounds for land mines and transport supplies through dangerous roads, such as battlefields. These machines, if successfully developed, are expected not only to save money, but human lives as well. The U.S. army announced its plans to spend more than $14 billion on automated navigation systems, which will be fitted on existing military vehicles. Today’s advanced sensor technology enables the development of autonomous interaction systems, which can deliver messages to the army bases, automatically cutting off communication links, in case they sense the signals may be intercepted. Scientists working in this field say the basic functioning has already been figured out and now, the goal is to improve it in such a way that will make the systems practical for use. “Developing a robot is like raising children” – they say. The future of autonomous vehicles looks promising – researchers are developing advanced techniques that will provide new capabilities to the machines – they expect the cars to learn more tactical behaviors, like running and hiding in presence of enemies, interacting with other robots on the field and communicating with the human commanders in real-time. “We need to work on the nervous system of the robots, so it can really learn on its own by picking up patterns based on its prior experience,” said Charles Shoemaker, chief of the Army Research Lab‘s robotics project office. Perhaps humanity isn’t prepared to stop wars, but it is certainly prepared to take humans off the battlefields. And this would be a tremendous achievement. TFOT had a quick interview with DARPA a day before the 2007 Urban Challenge to learn more about the competition and its importance. Q: What sort of benefits do you expect robotic vehicles will bring to the battlefield? A: The Urban Challenge will bring us closer to deploying robotic ground vehicles on the battlefield to perform hazardous tasks that currently threaten the lives of American men and women in uniform. Q: Have any of the technologies developed during previous Grand Challenge competitions been incorporated into existing or in-development military equipment? A: Transportation, reconnaissance, surveillance and bomb detonation are just a few examples of potential near-term battlefield applications for robotic vehicles operating autonomously or as part of convoys. 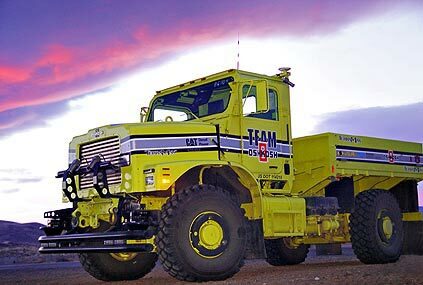 Q: The vehicles demonstrated at the Grand Challenge stillsignificantly lack the practical skills when on the road, and their behavior isoften problematic when the cars attempt to complete two different taskssimultaneously – such as avoiding an obstacle and continuing to follow the GPSinstructions. In addition, they are much slower than conventional cars – ondifficult and clear roads. When and how do you see these problems solved, sothat robotic vehicles will not have any disadvantages over manned vehicles? A: When DARPA held the original Grand Challenge in 2004, not a single team managed to finish the 142-mile course or even make it past ten miles. In the 2005 Grand Challenge, four teams successfully navigated the 132-mile course. This year, the Urban Challenge includes a series of rigorous and complicated qualifying tests and the course itself has been designed to be a realistic simulation of an urban battlefield environment. The leap in terms of what these vehicles are able to accomplish since DARPA first envisioned this challenge is truly remarkable. There is every reason to believe the Urban Challenge will continue the tremendous gains that have already been achieved in the first two Grand Challenges. Q: In your opinion, what are the main challenges researchers and engineers in the robotic vehicle industry face? A: For a long time, there was no central call to action that challenged researchers, engineers, students and backyard mechanics to apply their smarts to harnessing the potential of autonomous robotic ground vehicles. People all over the world were developing technologies with potential applications, but there was no focal point that brought all of them together. That all changed when DARPA announced it would hold the first Grand Challenge. Today, the program has captured the imagination of people all across America and around the world, and has created an entire community dedicated to fostering the development of life-saving national security technology. Q: The DARPA Grand Challenge is often considered to be the stage forpioneers in the automotive industry, and some have compared the 2005 race to theWright Brothers’ first flight in 1903. Do you think robotic cars will quicklyintegrate into our everyday lives, just like airplanesdid? A:Many of the safety features that are being developedfor passenger vehicles employ the same types of technologies that are used byUrban Challenge teams in their vehicles. Examples of current and futurepassenger car safety systems that use sensing technologies similar to those inUrban Challenge vehicles include adaptive cruise control, lane departurewarning, blind spot detection and traffic sign recognition. Another relatedprogram is a research initiative between the automotive industry and the U.S.Department of Transportation, known as vehicle infrastructure integration, which isdeveloping technologies to allow for vehicle-to-vehicle, vehicle-to-infrastructure and vehicle-to-environment communication. Q: How is this year’s challenge different than that of previous years? and do you believe it is more difficult and if so, why? A: The emphasis on vehicle performance is evidence that the Urban Challenge is significantly tougher than the first two Challenges. Rather than simply navigating a fixed course in the shortest time possible, vehicle must successfully and safely perform missions in a more dynamic, unpredictable environment. Q: Do you believe that replacing one-third of the operational ground combat vehicles with unmanned cars by 2015 is a realistic goal in terms of the robotic car performance we have witnessed to date? A: The progress that has been made in the first two Grand Challenges and the Urban Challenge has provided a strong start to help meet the goal set by the U.S. Congress. Q: Apart from the Grand Challenge, is DARPA itself involved in automotive research of any kind – in vehicles or in other military equipment? A: All of DARPA’s research is focused on defense and battlefield applications. Automotive manufacturers and suppliers have devoted significant R&D resources towards developing technologies similar to those used on autonomous robotic ground vehicles, and the industry’s strong presence in the Urban Challenge is evidence of that. A:No decisions have beenmade about the future of the Grand Challenge/Urban Challenge program. After theUrban Challenge is complete, DARPA will evaluate the program and begindeliberating about what is next. 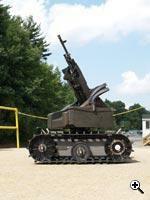 Further discussion of DARPA’s 2007 Urban Challenge can be found here (TFOT’s forums).